The Abby Sofa exudes distinct 1950s character and faithfully captures the essence of mid-20th century soft furnishings. Featuring thick padded seat and back cushions, upholstered in a chic microtweed with classic tufting, the Abby Sofa is atop solid tapered wood legs. Three guests sit comfortably across two extra-wide seat and reversible back cushions and are well-supported by the Abby's hardwood inner-frame and sinuous spring system. Since the 20th century, tufted upholstery has grown in popularity. Countless centuries old, tufting is a technique that has been embraced by notable designers of modern furniture, from the Bauhaus period to present-day. From Le Corbusier and Van Der Rohe to Hans Wegner and Ducaroy, the times have proven that clean lines and accented button tufting never goes out of style. While many of the distinguished works produced by such makers remain available today at a premium, the Abby Sofa provides an iconic look at an unparalleled value. Incredibly comfortable & stylish!! Love it!! Loving the retro look!! So much more comfort than I thought just from the photos! Happy to own! Seat cushions are AMAZINGLY plush and comfy! This couch is super cozy - it seriously exceeded my expectations as i thought it looked kinda stiff in the photos but it surprised me! REALLY HAPPY! quaint, cute, charming! I adore my new sofa! simply gorgeous, this sofa is the perfect size, shape and color for my space, i love how well it goes in my living room, so happy! simply perfect. so pleased with my choice! chic and elegant! I love my new sofa! Customer service was excellent. 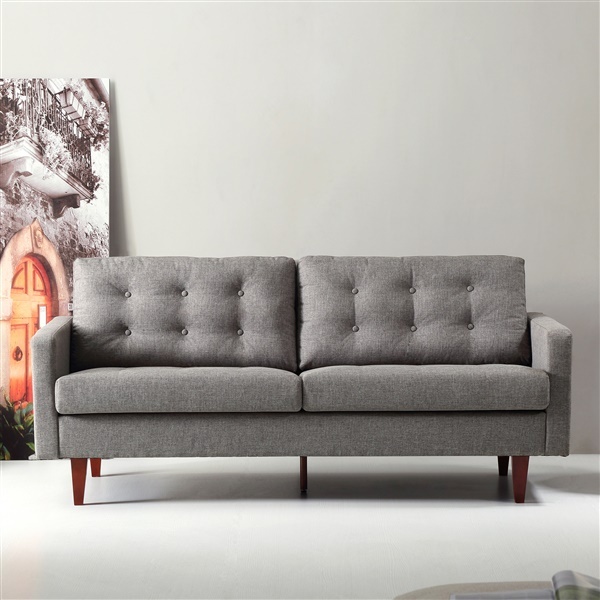 I ordered this sofa in the light grey color and it's stunning! The tufting adds the perfect subtle detail. Very happy!! My fiancé and I needed a sofa as we just moved and we had a tough time finding something that was the right size and color. Inmod was recommended to us and we took a look. We stumbled upon so many things we love but especially this sofa!! It shipped fast and we were so excited to get it set up. It looks amazing in the space and it's comfortable. We use it every day and are thrilled. We will 100% be purchasing more from Inmod. Does this come in any other colors. Or, can you choose your own color? This item is only available in the colors as shown. The Abby Sofa is manufactured in China. Where is the Abby sofa manufactured/assembled? Nice looking sofa! What are the following dimensions, please? Arm height (dimension from floor to top of armrest) Leg height (dimension from floor to top of leg/bottom of sofa) Seat height (dimension from floor to top of seat cushion) We're considering pairing the Abby Sofa with a Flo Sofa, and we want to know how the two relate to each other. For the Abby Sofa, the seat height is 18", the arm height from the floor is 23.5" and the legs are 5"
Two questions: What kind of assembly does this require? What are the dimensions of the packaged sofa? Assembly on this sofa is quite easy. You just need to attach the legs to the frame. The size of the carton is 75" x 34" x 19" and it weighs 103 lbs. Can the cushion covers be removed and cleaned? Since the Abby Sofa cushions have tufting, the upholstery can not be removed. What material covers this sofa? Wool, cotton, polyester, etc.? The Abby Sofa is upholstered in a stain resistant polyester tweed material. It is soft to the touch yet durable for everyday use.